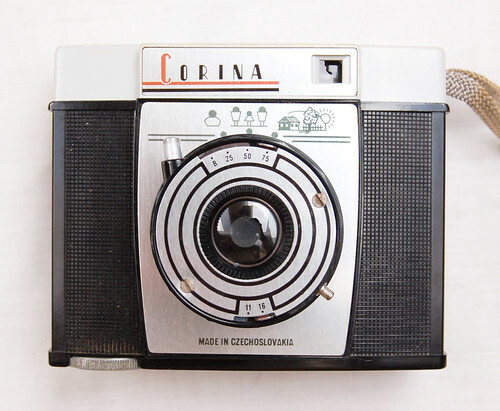 The Corina is a simple plastic camera made by Druopta in Czechoslovakia, c.1960. It takes twelve 6x6cm images on 120 film. The Corina 2 is dual-format, with two red windows on the back, and with removable masks to reduce the frame size to 4.5x6 cm. The body of the camera is made from a thermoset resin plastic, and it has a pale-grey top housing in a different plastic. The lens is an achromat, with stops at f/11 and f/16. The shutter has speeds 1/25, 1/50 and 1/75 second, plus 'B'. The lens and shutter unit screws into the body when not in use, and the same thread allows focusing, using zone symbols. ↑ 1.0 1.1 1.2 Corina 2 offered for sale at Ebay (item 111482276607), October 2014. The seller, usually reliable, describes the lens as an achromat. This page was last edited on 10 January 2017, at 11:41.